Sheen Slings is a sling library and consultancy providing expert helpful and impartial advice to help you find and fit the best baby carrier or sling for you and your little ones needs. A comfortable carrier can make all the difference – giving you back your hands whilst baby sleeps on you, helping to soothe colicky episodes, the freedom of buggy-free travel while traversing London or on a Sunday hike, as well as just making the most of those snuggles as your baby grows! But the key is finding the right one for you! And getting the right advice to ensure you get the most out of it. That’s where Sheen Slings come in. We offer private consultations, workshops, free drop in library sessions, gift certificates and all our carriers can be hired out allowing you to try at home before you buy, or even borrow something for a holiday! 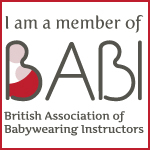 So please explore our website, come to the library or get in touch and let us take all the guesswork out of getting the right sling and get you started down the road to baby wearing joy!